Click here to read about how you can get BONUS chips for each tournament you participate in! 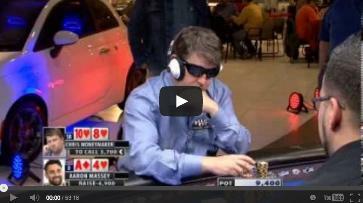 Aaron Massey, Mike Steinberg, Pawel Andrzejewski, Chris Moneymaker, Nick Brancato, and Donald Bates remain. Who will take down the title and the top prize? Click the image to watch the exciting finale! We are excited to feature another high buy-in deep stacked televised feature table. This year we increased the buy-in to $3,000 with a 1 time only re-entry option of $1,000 for the event. We have invited some of the world’s best players to participate at our TV table. We have some familiar faces, and some new players that will make for a very competitive and exciting Sit N’Go. Returning to our TV show is 2007 WSOP Main event champion Jerry Yang, Radio Host and Sun-Times columnist Richard Roeper, WPT Boot Camp instructor Nick Brancato, and 2010 Windy City Poker Championship Main Event Champion Michael Sabbia. New players to our TV show include 2003 WSOP Main Event Champion Chris Moneymaker, and Chicago native and professional player Aaron Massey. 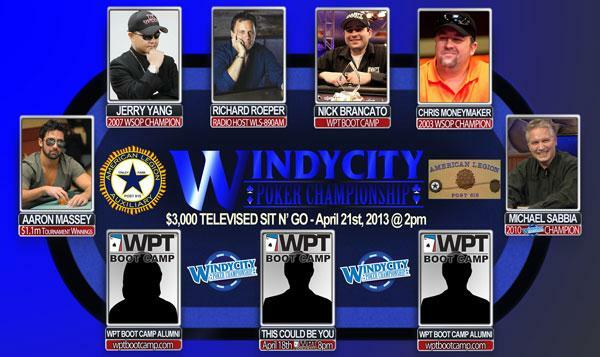 Season 3 of Windy City Poker Championship is Here!